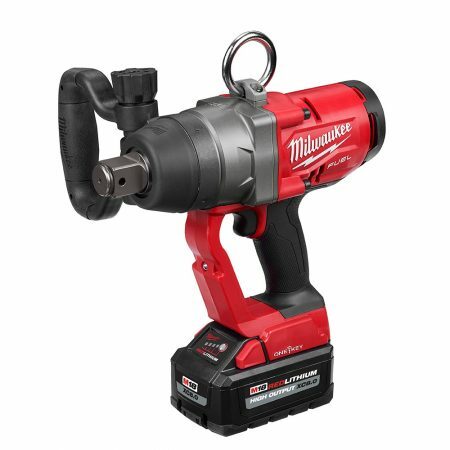 Milwaukee Tool just elevated the productivity for users who fasten up to 1-3/4” bolts with the introduction of the first and only cordless 1” high torque impact wrench. An incredible breakthrough for cordless power tool technology, the M18 FUEL 1” High Torque Impact Wrench w/ ONE-KEY is also the world’s most powerful cordless impact. It utilizes advanced M18 FUEL technology to deliver up to 1,800 ft-lbs of nut-busting torque while remaining 7 lbs lighter than the leading corded option currently available. A brand-new POWERSTATE brushless motor packs more torque for demanding applications, while redesigned REDLINK PLUS Intelligence drastically reduces the size of the electronics to save space and increase thermal capacity and communication between the tool, motor, and HIGH OUTPUT XC8.0 battery. Finally, the mechanism has been optimized to deliver this incredible raw power in the most lightweight package possible. The tool is also designed with a four-mode DRIVE CONTROL™ feature, providing users the versatility to switch between modes to match the power and speed for the application. As an added benefit, ONE-KEY,** provides the ability to customize, track and manage this impact wrench, as well as set a repeatable torque. *M18 FUEL is engineered for the most demanding tradesmen in the world. Delivering unrivaled performance, all M18 FUEL products feature three Milwaukee-exclusive innovations — The POWERSTATE Brushless Motor, REDLITHIUM Battery Pack and REDLINK PLUS Intelligence Hardware and Software — that deliver unmatched power, run-time and durability on the job site. Simply put, M18 FUEL tools are the most powerful 18V cordless tools in their class.